There's no magic recipe in spite of decades of research on the topic: Product innovation remains arduous if not elusive. Businesses are still frustrated by a lack of market-impacting, innovative products; frustrated by a stream of unexceptional solutions that fail to inspire customers or provide competitive advantage. So, you are not alone if your business suffers from a portfolio of "typical". 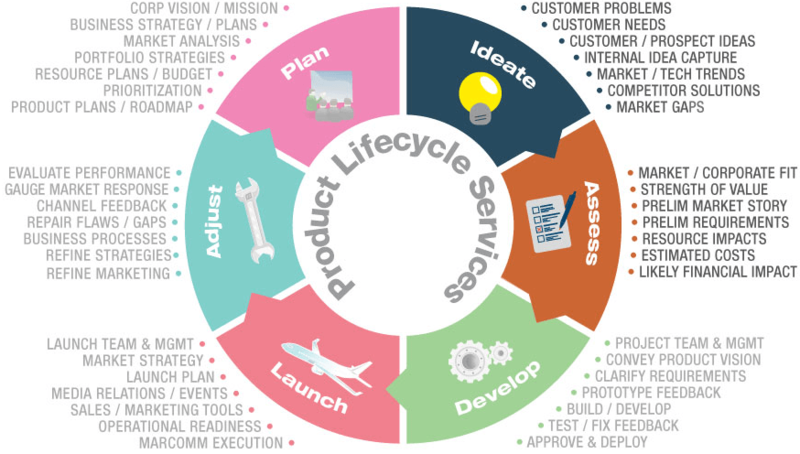 Our product innovation consulting services cover the concept phase of the product lifecycle: market insight, ideation, assessment, approval & prioritization. This part of the product pipeline is so crucial that those who do it poorly eventually decline and fail, while those who do it well gain competitive advantage, market share, and more profitable growth. Customer empathy and insight are foundational to almost all product and marketing efforts -- certainly innovation. We help clients develop those insights using a variety of techniques, including quantitative and qualitative research studies, secondary research, informal dialog with customers, sales teams, customer support teams, industry experts, etc. Result: Customer empathy that spurs innovation and enables exceptional product and marketing Strategies. Innovative products transcend convention to uniquely address customer problems, needs or aspirations. What is preventing your business from generating disruptive, innovative ideas? Are you faced with structural impediments, human impediments, or both? Our consultants help clients address innovation impediments and capture creative ideas, regardless of their source or readiness. Result: More innovative product concepts that potentially generate "game changing" impacts to your business. While the concept of nurturing is straightforward, its execution is problematic. Too often, high-potential ideas are dismissed before adequate consideration. "Early dismissal" has many causes, so our consultants help establish processes and encourage cultures to overcome the natural bias towards near-term, low-risk ideas. Result: A new organizational mindset that coaxes creativity and big ideas eventually reaping outsized rewards. "Death by Analysis!" That's not us. Instead, our consultants help product teams and leadership focus on validing key assumptions. What must go wrong (or right) for the product to fail (succeed)? What are the likely impacts? Poor concept assessments lead to poor decisions, which of course lead to many downstream consequences. Our consultants help product teams learn how to craft concept assessments using crisp, clear and objective analyses necessary for "eyes open", sound decisions. Most businesses are faced with more ideas than resources, and determining which product concepts to develop (and which to discard or freeze) may be the single most critical function of effective product management. We help businesses establish systems that facilitate good decisions without compromising speed-to-market. Result: The right projects are quickly approved and funded. For most organizations -- especially larger ones -- the prioritization process is painful. It gets ugly with too many projects, limited resources, and competing project sponsors. Our consultants help clients establish and refine an objective prioritization process that mitigates bias and "politics" while maximizing business impact. Result: A less painful and more effective prioritization process.